The Lao garment industry has been on the decline. The value of exports increased from US$87 million in 1995 to a peak of US$219 million in 2011, before gradually falling to US$174 million in 2015. The share of garments in total exports also declined from an average of 36 per cent during 2001–2005, to only 8 per cent during 2011–2015. Photo: Laotian textile factory workers at work sewing clothes for export to Europe. Foreign direct investment in the garment industry has also fallen significantly from a total value of US$65 million during 1991–2000 to US$29 million during 2001–2010 and less than US$10 million during 2011–2015. So what explains this decline? The Lao garment industry has been losing its competitive edge. The revealed comparative advantage (RCA) index of the Lao garment industry decreased from an average of 13 during 2001–2005 to just 4 during 2011–2013 due to the emergence of other major export commodities from Laos such as mining, electricity and electronic parts. Although the RCA remains above one (meaning that Laos still has a comparative advantage in this industry), its decline signals that the industry has lost competitiveness over time. Declining demand in the world market is one of the key reasons for the slowdown. The majority of the Lao garment industry provide cut, make and trim (CMT) services and are usually sub-contractors of other larger companies, often located in neighbouring countries. The size of Laos’ industry is much smaller than its neighbouring competitors. Most of the garment factories base production quantities on export demand. 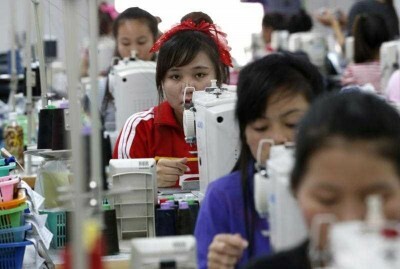 So the slowdown in European economies and other markets has led to a decrease in orders for Lao garments. In addition, the Association of the Lao Garment Industry suggested that the European market not only makes fewer orders but demand has also recently shifted towards cheaper products. Labour shortage is another major bottleneck in the industry. A major increase in Thailand’s minimum wage in 2012 has made the Thai labour market very attractive for workers from neighbouring countries, including Laos. There has also been an increase in competition for labour from other sectors in the domestic economy, such as the booming services sector as well as other manufacturing sectors, particularly those in Laos’ special economic zones. This has made it more difficult for the garment industry to find and retain labour, especially in major manufacturing hubs. Low labour productivity in the garment industry has translated to a higher unit production cost. Laos’ minimum wage in nominal terms is quite competitive in the region, but labour productivity in the garment industry is significantly lower than that in neighbouring countries. So when labour productivity is accounted for the implied real wage is considerably higher, making the profit margin quite thin. This is especially so for the CMT-based factories in which wages cover more than half of their production costs. The Lao garment industry also lacks supporting industries. The majority of inputs are sourced from overseas, usually through their parent companies, contractors or buyers. Carton boxes are the only input that can be found domestically. The lack of domestic inputs limits the possibility of backward linkages. The small scale of the Lao garment industry coupled with the lack of experience and capabilities in the private sector have locked Lao garment factories into simple CMT services with little scope for them to integrate into regional and global supply chains. This lack of supporting industries has hindered expansion. The Lao garment industry needs to increase its cooperation with regional garment producers — especially larger companies located in Vietnam, Thailand and Cambodia — so that it can grow together with the region. This subregional market would be better treated as a single integrated production block with a clear division of labour based on each country’s strengths and limitations. Vanthana Nolintha is a Researcher at the National Economic Research Institute in Laos.